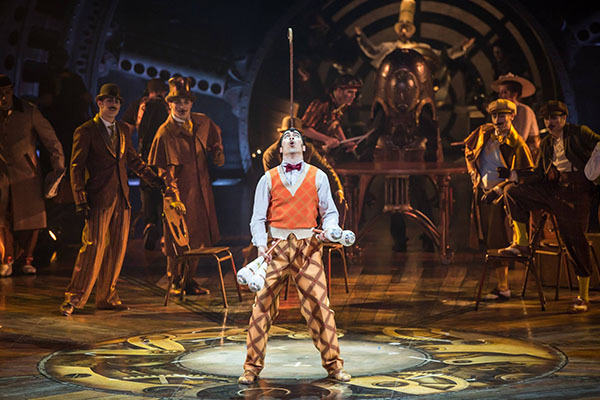 KURIOS – Cabinet of Curiosities premiered in Montreal in April of 2014. Since its debut, the spectacle has brought joy and wonder to audiences across six continents, reaching more than 180 million people in more than 400 cities. This traveling show has 4,000 employees, including 1,300 performing artists from nearly 50 different countries around the globe. The troupe uses a total of 426 props, which is the most of any Cirque production in its history. There are over 100 beautiful costumes worn by the performers, which are carefully handled and also repaired between shows. Counting the hats, shoes and wigs, there are over 800 costume pieces required for the show. As the troupe travels the show circuit, they are accompanied by 2,000 tons of equipment, transported in 65 trucks, from city to city. 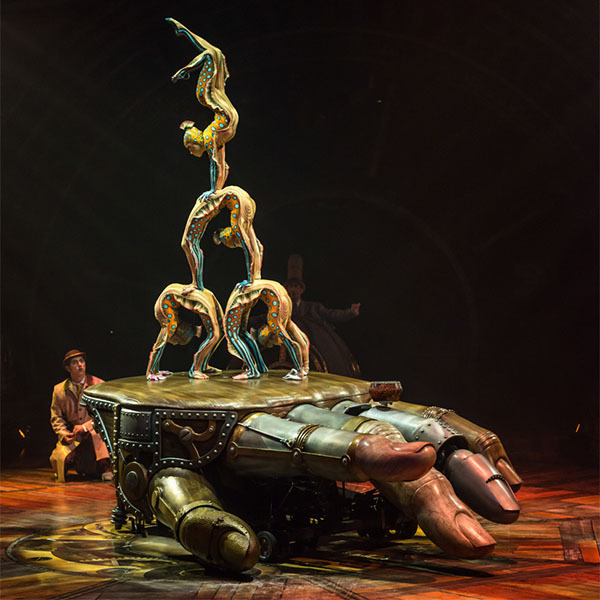 A mechanical hand weighing 750 pounds, and 15 feet wide is part of the set design. Talk about a big hand! 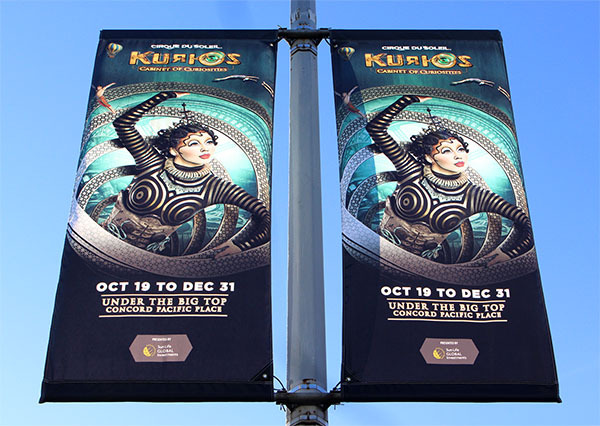 The Flag Shop Vancouver is super excited to be the supplier to our client Live Nation, the show’s promoter, for whom we produced over 450 beautiful, custom printed banners to celebrate and promote KURIOS. 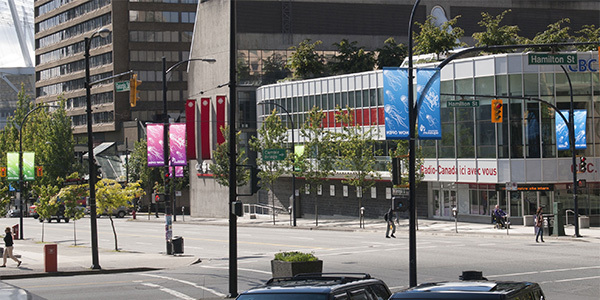 These vibrant banners now adorn the streets of Vancouver, a simply stunning sight against the city’s skyline. The show opened in Vancouver one week ago and audiences have been wowed by a world-class entertainment experience. The story is about a scientist who, when learning about electricity, discovers an invisible world – a place where the craziest of dreams and the grandest of schemes are waiting to be born. In this alternate yet recognizable world, wonder awaits anyone who dares to trust their imagination, unleashing the magic by closing their eyes. From his bigger-than-life curio cabinet, the “Seeker” finds this hidden world of magic and wonder. A rare collection of characters from another world comes to life, entering his improvised mechanical world. As the peculiar characters turn his world topsy-turvy, his trinkets come alive right before his eyes. 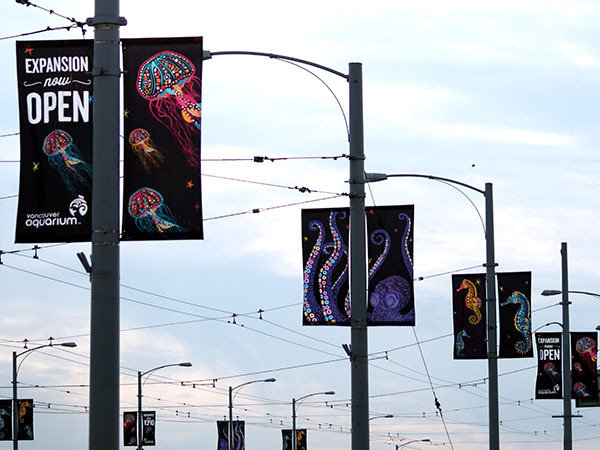 The Flag Shop supports the arts and entertainment industry in many capacities, from designing custom banners to supplying international flags. Have you ever met Chester? Well, everyone has a story and Chester is no different! 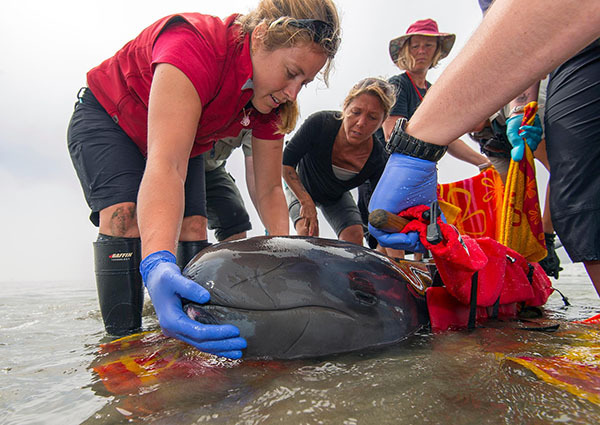 He was just a little “baby” false killer whale (a member of the oceanic dolphin family) when he was rescued on the beach near Tofino, BC, in the summer of 2014. At the time, he was only a few weeks old and hadn’t even grown teeth yet. Stranded on North Chesterman Beach, hurt and scrawny, no other members of his species were nearby – not even his mother. Chester was brought into the care of the Vancouver Aquarium’s Marine Mammal Rescue Centre. Once he was restored to tip-top shape, a group of marine mammal experts, who were called together by the Department of Fisheries and Oceans, all agreed that Chester could not be released into the wild. He’d had considerable contact with humans, was very young, and lacked hunting and social skills. False killer whale calves at his age, in the wild, are completely dependent on their mothers. 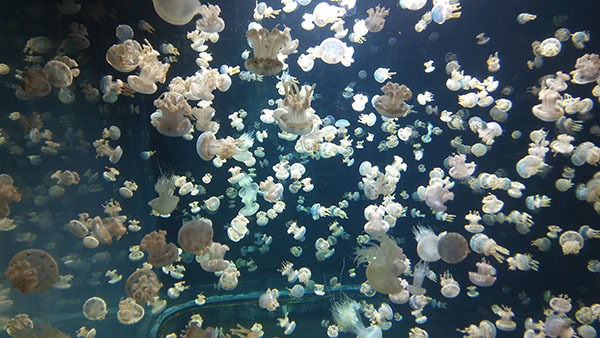 If you’ve ever had the privilege of visiting the Vancouver Aquarium, then you will understand first-hand the beauty, awe, and wonder of seeing marine life up-close. 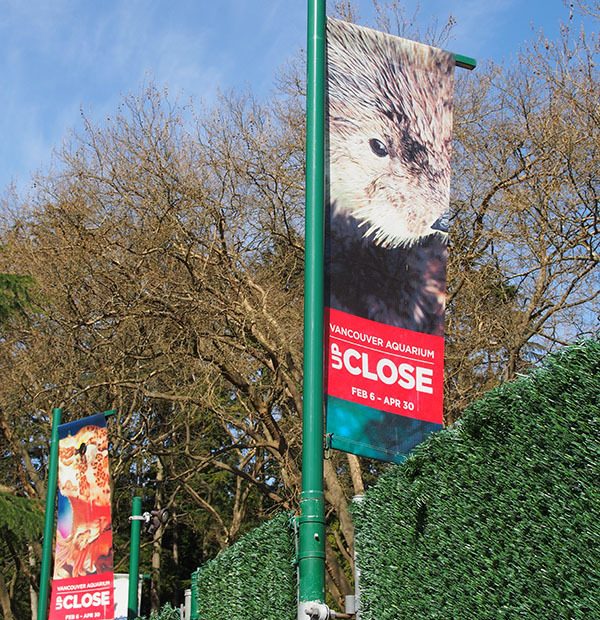 The Vancouver Aquarium has been involved in the rescue of marine mammals for more than 40 years, rehabilitating and releasing animals, including California sea lions, harbour seals, Stellar sea lions, elephant seals, a harbour porpoise and even a killer whale. 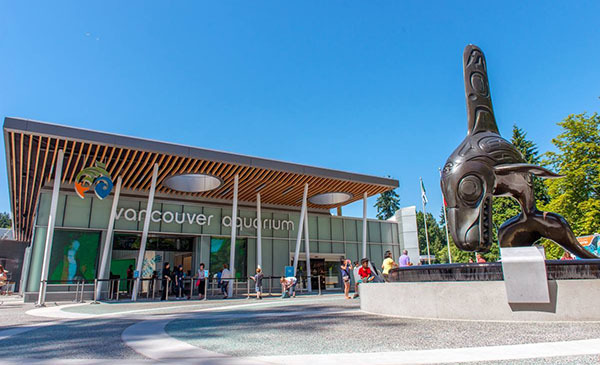 As the first-ever and largest public aquarium in Canada, the Vancouver Aquarium takes pride in its global reputation as a leading marine science centre. Home to more than 70,000 animals, more than one million people from all over the world visit every year to see the whales, dolphins (like Chester), snakes, and otters, to name just a few. 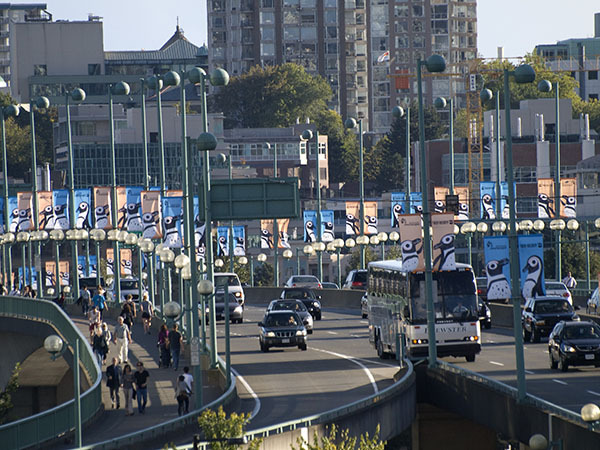 The Flag Shop has worked with the aquarium on many special projects over the years, producing everything from custom banners, to event backdrops, tents, curtains, pennant strings and of course, flags. Through our interactions, we know the aquarium is about so much more than beauty and wonder (as if that were not enough)! 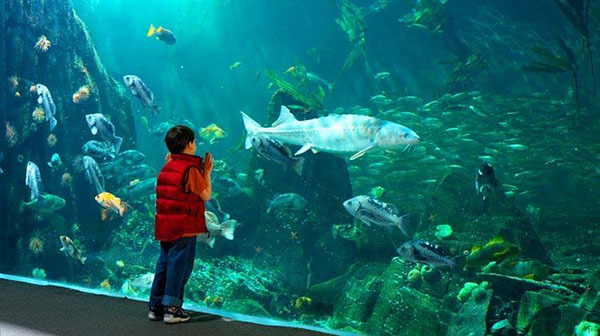 The aquarium is also an Ocean Wise® initiative. 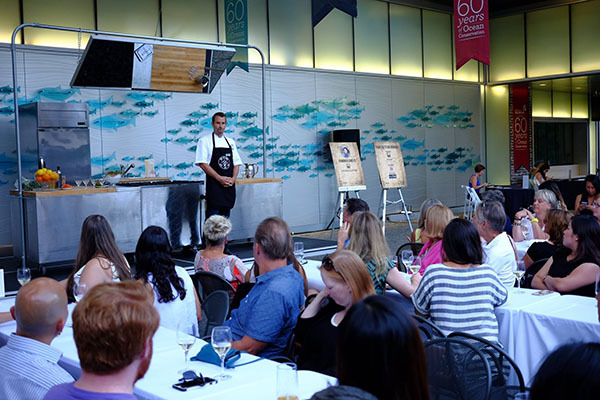 Ocean Wise® is an organization of educators, conservationists and scientists who work together to fulfill a vision of a world where our oceans are healthy and flourishing. Over-fishing is a real and global concern, combined with the threat of extinction of ocean species, relating to climate change. The Vancouver Aquarium is a leader in taking action against this threat through its research and conservation efforts. Ocean Wise® certifies sustainably harvested seafood, helping consumers to make informed and responsible decisions with their seafood menu selections. Co-op Week 2017: It’s Here! Comments Off on Co-op Week 2017: It’s Here! Co-ops are the life of the party. 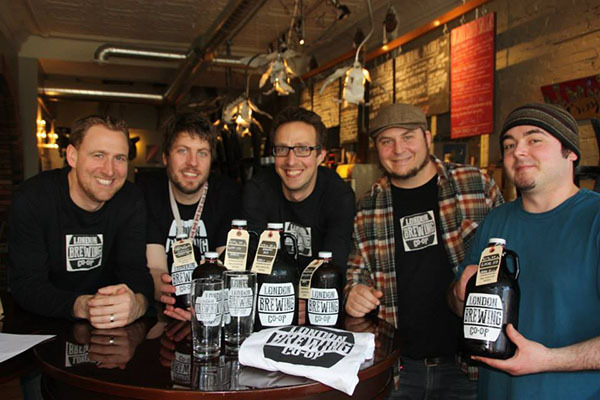 The London Brewing Company in Ontario is the first worker’s co-operative brewery outside of Quebec. It’s owned by the people who work there, with each one participating in setting the direction of the business, in a democratic manner. They’ve got “Local 117” on tap now. 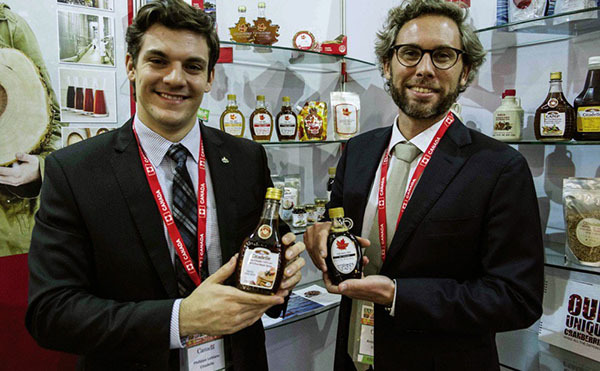 Your pancakes taste better because of co-ops – 35% of the world’s maple syrup supply comes from Canadian co-ops. Thanks to Holland Flora, a flower co-op in the Netherlands, our world is more beautiful and smells nicer, too. 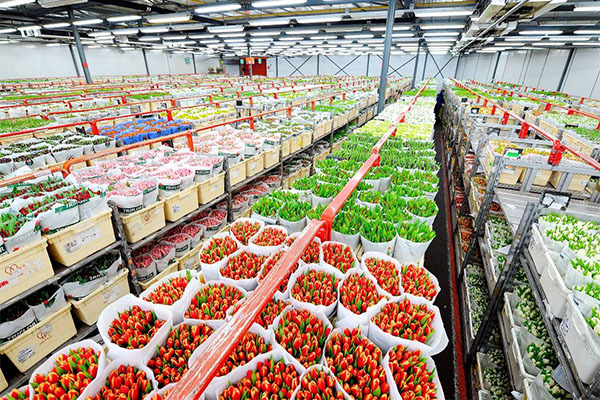 This European co-op holds 44% of the world market, selling 19 million flowers and two million plants every single day! 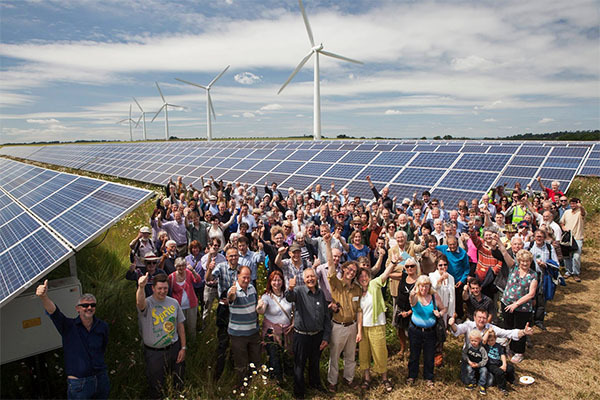 Ontario is home to eight renewable energy co-ops and the Toronto Renewable Energy Co-op was the first-ever green power community co-op in Canada. When it comes to green energy, Ontario tops the list! TREC is Canada’s leader in the development of community owned renewable energy. Source: TREC Renewable Energy Co-operative. 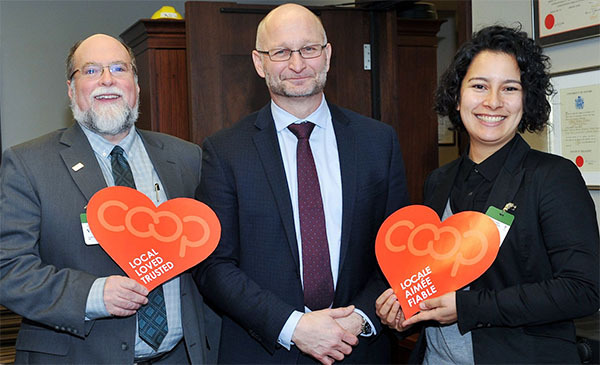 There’s no doubt that co-ops are leaders in many business sectors, and during Co-op Week, we celebrate with them for all that they do to help to build a better world. Co-operatives are all about achieving sustainable social, economic, cultural, and environmental goals, as guided by international co-operative principles and values. 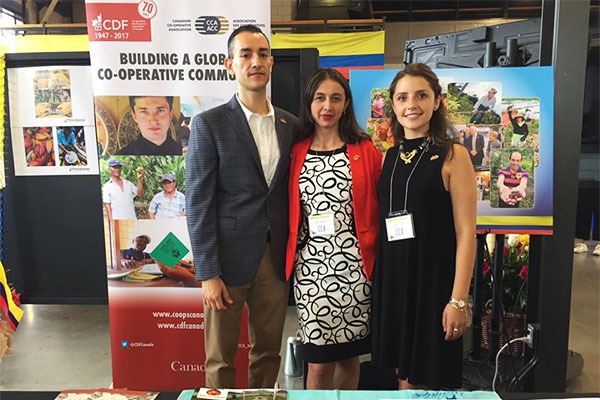 Since 1987, the CCA has been organizing and assembling the human and financial resources of Canada’s co-operatives and credit unions to bring valuable international development programs. This is accomplished with the support of local partnerships in Africa, Asia, Eastern Europe and the Americas, on behalf of the Co-operative Development Foundation of Canada (CDF) and Global Affairs Canada. In 2014, Co-operatives and Mutuals Canada (CMC) was launched by combining the experience and history of two large co-op organizations: the CCA and le Conseil canadien de la coopération et mutualité (CCCM), which had, up to that point, been operating separately. As a bilingual association, the CMC represents more than 18 million members from 9,000 co-operatives, giving a united voice to its membership. CMC focuses its activities on helping co-operatives establish themselves, develop, and prosper. Through federal government advocacy, CMC offers a knowledgeable voice to support national policies which strengthen the co-operative economy. With its members representing many sectors including agri-food and supply, housing, finance, insurance, wholesale and retail, health, as well as the service sector, CMC provides leadership for the benefit of all Canadians. The co-op way is all about people, empowerment, sustainability, autonomy, community and caring for one another. It’s no wonder we love supporting co-ops and all the important work they do, here at home and around the world. To learn more about the CCA or the CMC, please visit their websites: canada.coop and coopscanada.coop. For more information about our co-op product line, please visit our co-op products website at thecoopstore.ca. Imagine a world where every dollar you spend supporting your local co-op increases reinvestment opportunities in your community. Then imagine, as a co-op member, you are also an owner, holding shares in the co-op. And finally, imagine that you receive a portion of the profits each year, based on how much you spend at your own co-op. This is the beauty of the co-op: membership is ownership, and profits are shared with all owners. 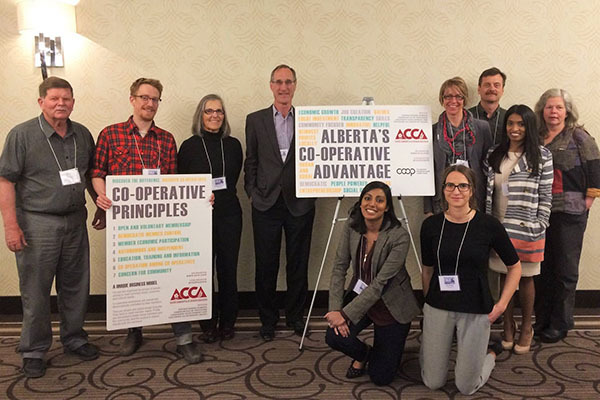 As we continue our special co-op blog series leading up to Co-op Week, which runs from October 15 – 21, we feature the Alberta Community and Co-operative Association (ACCA). 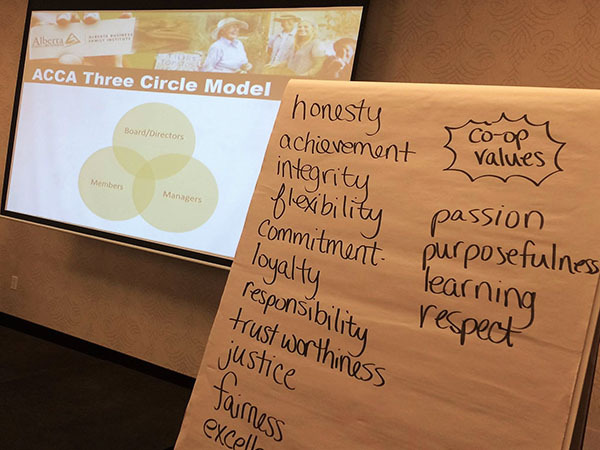 The mission of the ACCA is to strengthen the communities of Alberta by promoting co-op values and developing co-op leaders. All co-ops are bound by a common set of values, including solidarity, self-help, self-responsibility, and democracy. Guided by co-op values and principles, the ACCA supports co-ops to address the social, cultural and economic needs of Albertans. The ACCA is part of a national and international association of businesses which places people ahead of profits, co-operating to advance community well-being. Co-ops are started when a group of people see a specific need or opportunity within their community, then grow and prosper under their own vision and direction. Alberta is known as a destination for many things, including the majestic Rockies, the Calgary Stampede, and the world’s only permanent Star Trek museum. It’s even where the phrase “trick or treat” was first used on Hallowe’en! It’s also a place where more than one million people – roughly one quarter of its population – choose to be members of co-ops. Every type of co-op can be found, ranging from grocery co-ops to housing co-ops, credit unions, gasoline co-ops, insurance co-ops, farm supplies co-ops and even utilities co-ops. The ACCA builds and strengthens relationships within the community to fulfill its goals of advancing co-op leadership and promoting co-op values. 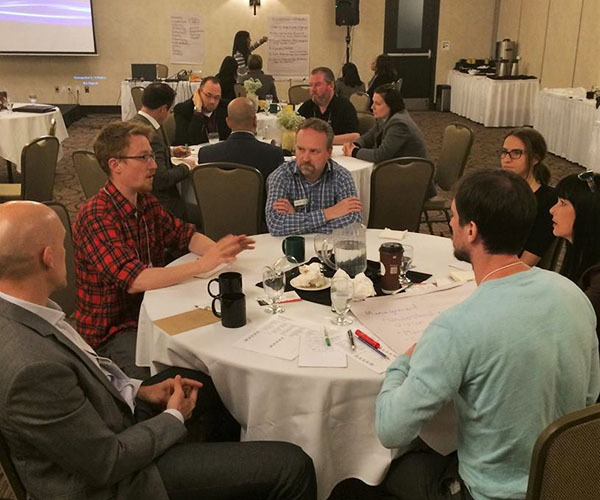 The association engages organizations in important dialogue about Alberta’s “co-op advantage”, including municipalities, the provincial government, economic development organizations and learning institutions. Various types of co-operatives in Alberta. 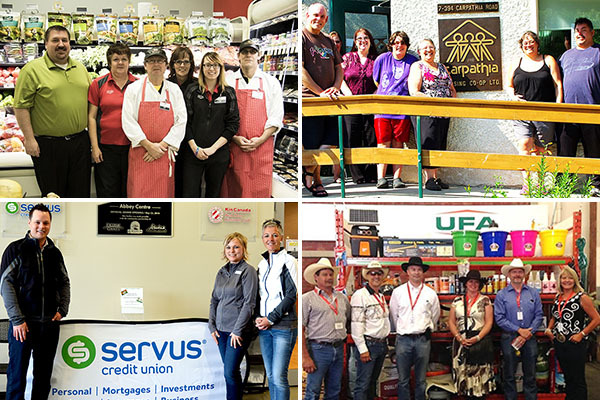 Clockwise from top left: Central Alberta Co-op, Carpathia Housing Co-Op Ltd, Servus Credit Union, and United Farmers of Alberta Co-operative Ltd.
With two Flag Shop locations in Alberta for 25 years, one in Edmonton and the other in Calgary, we’ve known about the ACCA and their outstanding community work for many for years. 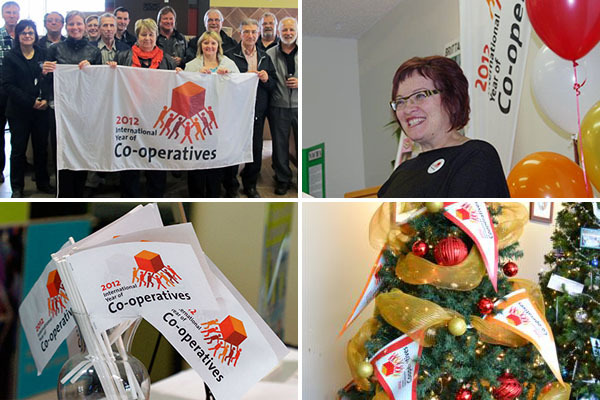 In one of our most memorable projects, we worked together providing polyknit flags, buttons, friendship pins, magnets, pens, pennant strings and paper flags to support “2012 International Year of Co-operatives” celebrations. With Co-op Week right around the corner, we celebrate and acknowledge the work of the ACCA for supporting co-op education and for promoting the co-op way of doing business, impacting co-operators across Alberta and beyond, all while helping to build a better world. For nearly seven years, The Flag Shop has been proudly supporting Co-operatives and Mutuals Canada and the International Co-operative Alliance initiatives across Canada and around the globe. For more information about our co-op product line, please visit our co-op products website: thecoopstore.ca. To learn more about The Flag Shop and to see everything else we can do, go to: www.flagshop.com. You are currently browsing the The Flag Shop Blog blog archives for October, 2017.